Hotel Check In & Check Out Time 12:00 Noon. Water, Soft & Hard Drinks, Adventure Activities. Political Disturbances (Strikes), Etc. To Be Borne By The Guest. Please proceed to EXIT C, NEAR GATE NO.10 where you will be met by Airport representative. contact details at the time of Check –In. world from the glass bottom boat (included in the package). physical problem or congenital disease, please urgently inform tour guide. 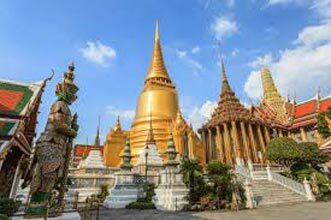 details for your Tour Guide in Bangkok and reconfirmation of pick up and schedule. No Show due to delays by clients will be treated as a No Show and no refund is applicable. service on the Emergency Contact number for Tours. guests are requested to handover the belongings at the reception. and the most number of Buddha images in Thailand. mining to finishing of diamond and other Thai local products. An ideal place to buy souvenirs. 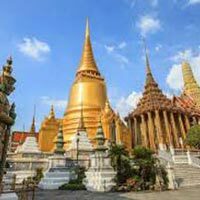 Day at leisure for your own activity or Explore the Bangkok By walk Shopping Near by Area. 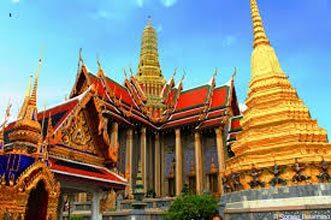 Arrive Bangkok International Airport and proceed for you flight back to India. Notes:- Rates are on quotation level basis, final rates will be decided at the time of actual confirmation. 100% Payments should be made before 15 days of departure . No refund will be arranged for an unused / no show services. ROE Will be XE.COM + 1 , at the time of payment . PLEASE NOTE THAT ROOMS & RATES ARE SUBJECT TO AVAILABILITY THINGS TO KEEPING MIND. 1) Standard Check out time for all hotels is 1200 hrs. No matter what your pickup time will be at late afternoon or evening, guests are requested to complete the formalities of Check Out must checkout at 12.00. 2) Request for Late Checkout should be made directly at the hotel reception and is strictly at the discretion of the hotel. 3) For a guaranteed late Check Out, additional charges are applicable. The guests may pay directly or contact their local travel agent in India to confirm the same at an additional cost. 4) Clients are requested to be available as per the Pick Up time as confirmed by the Tour guide. Waiting time for the driver is maximum 15 mins, after which the transfer will be treated as a NO SHOW. The client would have to make their own arrangements for airport drop, in case of missed transfer due to delay in reporting for transfers. No refund is applicable for such missed transfers. 5) In case the luggage capacity exceeds the permissible count, additional charges would be applied. 6) Duniyaonline.com or all Service providers are not responsible for loss of personal belongings and valuables. Rate is as specified in the package for respective PAX count only. Transfer service based on SIC TRANSFER strictly as per schedule. Tours Service are based on SIC TRANSFER with require a minimum of 2 pax traveling. For all missed transfer and tours, no refunds shall be made. Transfers are only applicable for hotels in CITY CENTRE and on the Timings SIC service Operates. Some schedule and timing detail may change upon the suitability and without prior notice. Normal check-in time is from 14.00 hrs. & check-out time is at 12.00 hrs. All clients are requested to be present at the hotel lobby 15 mins prior to the scheduled pick up time for tours and transfers. Booking Confirmation Policy: For Booking Confirmation, Only 50% Of the Total Package Cost Must Deposited In Our Company’s Account. After Receiving The Payment, We Will Process Your Booking Immediately And Issue The Hotel Confirmation Voucher, Car Voucher, Volvo Ticket Voucher, Sightseeing Service Voucher & Other Service Vouchers To You As An Attachment Of PDF File . You Are Requested To Carry These Issued Documents Print- Out Copy With You In During The Trip. The Remaining 70% Of The Payment Must Be Submitted Before Journey Date. 1. 25% Cancellation Of The Package Cost If Booking Is Cancelled Between 15 To Days Of The Travel Date. 2. 50% Cancellation Of The Package Cost If Booking Is Cancelled Between 7 To 3 Days Of The Travel Date. 3. 100% Cancellations Of The Package If Booking Is Cancelled Between 3 To 1 Days Of The Travel Date. 5. If Booking Is Cancelled 15 Days Before Of The Travel Date Then 1000/- (Per Person) Cancellations Charges Applicable As Communication Service Fees. 6. If Booking Is Postpone And Prepone 7 Days Before Of The Travel Date. Then Rs. 500 (Per Person) Service Charges Applicable On The Same.